Tyrannosaurus rex is one of the most famous dinosaurs. It has been frequently represented in film and on television, in literature, on the Internet and in all kinds of games. I propose to make this animal the type of the new genus, Tyrannosaurus, in reference to its size, which far exceeds that of any carnivorous land animal hitherto described...This animal is in fact the ne plus ultra of the evolution of the large carnivorous dinosaurs: in brief it is entitled to the royal and high sounding group name which I have applied to it. Tyrannosaurus gained widespread public attention on December 30, 1905, when the New York Times hailed T. rex as "the most formidable fighting animal of which there is any record whatever," the "king of all kings in the domain of animal life," "the absolute warlord of the earth," and a "royal man-eater of the jungle." In 1906, Tyrannosaurus was dubbed the "prize fighter of antiquity" and the "Last of the Great Reptiles and the King of Them All." In 1927, Charles R. Knight painted a mural incorporating Tyrannosaurus facing a Triceratops in the Field Museum of Natural History, establishing the two dinosaurs as enemies in popular thought; paleontologist Phil Currie cites this mural as one of his inspirations to study dinosaurs. Bakker said of the imagined rivalry between Tyrannosaurus and Triceratops, "No matchup between predator and prey has ever been more dramatic. It's somehow fitting that those two massive antagonists lived out their co-evolutionary belligerence through the very last days of the very last epoch of the Age of Dinosaurs." Tyrannosaurus rex has played a major role in many films, starting in 1918 with The Ghost of Slumber Mountain, written and directed by stop motion special effects pioneer Willis O'Brien. The Ghost of Slumber Mountain is also, and most likely, the first film showing Tyrannosaurus facing Triceratops. The king of the tyrant lizards came back in 1925 with the classic adaptation of Arthur Conan Doyle's novel The Lost World. Tyrannosaurus fossils weren't so famous at the time of the publication of the novel (1912), and the only main villain dinosaur on the book was Allosaurus, with no appearance of Tyrannosaurus, but this 1925 film featured Tyrannosaurus anyway, for a more dramatic and spectacular effect. 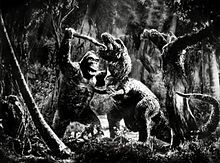 Stop motion animator Willis O'Brien, who had worked on The Ghost of Slumber Mountain and The Lost World, was again responsible of special effects in the 1933 monster movie King Kong, which featured a climactic battle between the giant ape and a Tyrannosaurus. The Tyrannosaurus model was made using a cast based on an early painting by Charles R. Knight. O'Brien stated that the battle between Kong and the Tyrannosaurus was one of the most technically difficult scenes in the film to animate. Many early films depicted Tyrannosaurus with an upright posture based on the current thinking of the time. Most of these films inaccurately portrayed the dinosaur with three prominent fingers on each hand like Allosaurus (though Tyrannosaurus had a third, vestigial finger, it wouldn't have been noticeable at first glance); Walt Disney is reported to have informed dinosaur hunter Barnum Brown that "it looked better that way," and the creature was depicted as such in Disney's Fantasia. Since that time, T. rex has appeared in a great number of "monster" films and educational documentaries. 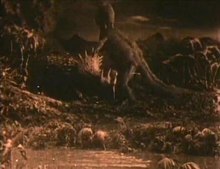 One of the first appearances which portrayed a proper posture and anatomy of Tyrannosaurus is the 1984 short Prehistoric Beast, fully conceived and made by Phil Tippett by means of his so-called go motion technique. One of the most iconic depictions of Tyrannosaurus in film was in 1993's Jurassic Park, where dinosaurs including T. rex are brought back to life using blood from fossilized mosquitoes. In the film, the dinosaur breaks free of its theme park enclosure, and proceeds to roam the park after attacking the visitors and killing one (a lawyer). In the film's finale, the Tyrannosaurus indirectly saves the main characters by killing the Velociraptors, who had been hunting them through the visitor center. The popularity of T. rex has long had a reciprocal effect on dinosaur science; the popularity of Jurassic Park factored into the discovery of the dinosaur genus Scipionyx; fossils of this genus had lain in storage in a basement in Italy until the film's release attracted attention from the fossil owner. Two Tyrannosaurus appeared again as primary antagonists in The Lost World, the sequel to Jurassic Park. In Jurassic Park III, it appeared briefly in a confrontation against the main antagonist, Spinosaurus, only to be killed by it. In a twist, the same Tyrannosaurus from the original 1993 film appears as the climactic protagonist in Jurassic World (2015), making an entrance by smashing through a Spinosaurus skeleton. Against the odds, it defeats the "Indominus Rex," with the assistance of a Velociraptor, dubbed "Blue," and a Mosasaurus. This specific Tyrannosaurus reappears in Jurassic World: Fallen Kingdom. Tyrannosaurus is one of the three dinosaur types whose physical characteristics were combined by the designers at Toho, to create the Japanese monster Godzilla; the other two dinosaurs were Stegosaurus and Iguanodon. Some Japanese animated films have a Tyrannosaurus as a main protagonist (You Are Umasou, 2010), as the main villain (Daikyouryu no Jidai, The Age of the Great Dinosaurs, 1979), as a minor antagonist (Magic Tree House, 2011), or as a neutral character (Doraemon: Nobita's Dinosaur, 1980, as well as its 2006 remake). Tyrannosaurus has starred in several television series, including children's programs, both in those intended as fiction, and, more recently, documentaries. In Barney & Friends, Barney is a stylized Tyrannosaurus rex. In the Australian children's show The Wiggles, the character "Dorothy the Dinosaur" is a stylized adaptation of a Tyrannosaurus. Some Tyrannosaurus characters appear in Dinosaur Train, most prominently Buddy. Tyrannosaurus was one of several dinosaurs featured in the 1974 Doctor Who adventure Invasion of the Dinosaurs, starring Jon Pertwee. A sleeping juvenile is also seen on the Silurian ark in "Dinosaurs on a Spaceship". A Time travelled Tyrannosaurus seen on London in "Deep Breath". In 1985 the 1984 Prehistoric Beast short was served to Robert Guenette to direct a full length TV documentary titled Dinosaur!, for which Phil Tippett made new Tyrannosaurus go motion sequences (chasing Hadrosaurus) in addition to those he made for Prehistoric Beast (where Tyrannosaurus was chasing Monoclonius). In the 1985 cartoon Transformers the popular Autobot, Grimlock, transformed into a mechanical Tyrannosaurus and in later incarnations a "Megaraptor." In the sequel series, Beast Wars, Megatron, the leader of the Predacons, turned into a techno-organic Tyrannosaurus. In the cartoon The Terrible Thunderlizards, 'Mr. T' plays a Tyrannosaurus rex called Mr. T-rex. General Galapagos, the boss of the Thunderlizards, is also a Tyrannosaurus. The T-rex plays recurring supporting roles in Dinosaurs (Roy Hess, Earl Sinclair's friend and the Sinclairs' neighbor), Dinosaucers (Genghis Rex, who is the leader of the Evil Tyrannos), Extreme Dinosaurs (T-Bone, the leader of the heroic group of the same namesake) as well as the anime television series Dinozaurs (as "Dino Tyranno" and his short-lived evil counterpart "Drago Tyran"). In Land of the Lost a Tyrannosaurus rex played the villain in both the 1974 series (as "Grumpy") and the 1991 version (as "Scarface", who had a scar covering his right eye). In the Ben 10 episode "Washington B.C." Dr Animo brings back a Tyrannosaurus with its skeleton. In Dino-Riders, the main villain Lord Krulos uses a Tyrannosaurus as his mount. In the Japanese TV series Dinosaur War Izenborg, a Tyrannosaurus named Ururu (renamed "Tyranis" in the US re-edit Attack of the Super Monsters) served as the main villain for the first half of the series. A Tyrannosaurus named Tyrannor was the main antagonist of Dink the Little Dinosaur. Documentaries and quasi-documentaries featuring Tyrannosaurus have included Dinosaur!, Dinosaur Planet, Prehistoric Park, T. Rex: New Science, New Beast, The Truth About Killer Dinosaurs, Walking with Dinosaurs, When Dinosaurs Roamed America, Sea Monsters - A Walking with Dinosaurs Trilogy, Valley of the T-Rex, Dinosaurs Decoded, Bizarre Dinosaurs, Animal Armageddon, Jurassic Fight Club, Dinolab, T-rex: Warrior or Wimp?, T. Rex: A Dinosaur in Hollywood, Dinosaur Revolution, and Planet Dinosaur, in which it only appears as a skeleton image. Chomper from The Land Before Time series, as well as Red Claw from the TV series, and Sharptooth from the original film are all tyrannosaurs. Tyrannosaurus-themed mecha have appeared in the Super Sentai series since Kyoryu Sentai Zyuranger in Shogozyu Tyrannosaurus, V-Rex of Mirai Sentai Timeranger, Bakuryu Tyranno of Bakuryuu Sentai Abaranger, Gozyu Rex of Kaizoku Sentai Gokaiger, Gabutyra of Zyuden Sentai Kyoryuger and recently Triamigo of Kishiryu Sentai Ryusoulger. They also appear in their respective Power Rangers adaptations in Season One of Mighty Morphin' Power Rangers, Power Rangers Time Force, Power Rangers Dino Thunder, Power Rangers Super Megaforce and Power Rangers Dino Charge. A CGI animated Tyrannosaurus rex named Tina Rex is a bully in Gumball's school in the 2011–present animated series on Cartoon Network, The Amazing World of Gumball. In literature, a dominant representation of Tyrannosaurus since 1990 has been that of Michael Crichton's, as seen in the novel Jurassic Park and its sequel The Lost World (homage title to the 1912 novel by Arthur Conan Doyle, about scientists discovering a South American plateau where dinosaurs still exist). Its skeleton was also used to illustrate the covers of these books. A Tyrannosaurus rex was the protagonist of the children's book We're Back! A Dinosaur's Story (later adapted into a feature-length film of the same name). Tyrannosaurus has also been featured in the novel Primeval: Extinction Event, by Dan Abnett. A depiction of a Tyrannosaurus on a German postage stamp. Tyrannosaurus has appeared in many media and is perhaps one of the most widely used dinosaurs. Various incarnations of, and creatures based on T. rex have appeared in video games, and several game series have featured Tyrannosaurus a centerpiece. These include 3D Monster Maze, the Dino Crisis/Dino Stalker line, various Jurassic Park tie-in games, the Turok game series, Tomb Raider, the Zoo Tycoon series, the survival game Ark: Survival Evolved, the simulation games Saurian and The Isle, and Super Mario Odyssey. 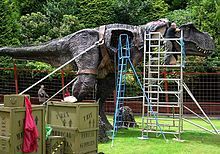 Full size animatronic Tyrannosaurus being assembled in Combe Martin Wildlife and Dinosaur Park, North Devon, United Kingdom. Numerous models and children's toys depicting Tyrannosaurus have been produced, particularly in promotion of the Jurassic Park films. The Carnegie Museum Dinosaur Collection toy line released two versions of the dinosaur, with the second brought in line with more modern scientific understanding. Sinclair Oil ads from the 1950s frequently featured T. rex, and products from radio-controlled helicopter models to a rifle cartridge (the .577 T-Rex) have been named after the dinosaur. In music, the popular 1970s glam rock band T. Rex took their name from the famous dinosaur. In the Calvin and Hobbes comics, fantasy sequences often featured Tyrannosaurus rex. In one story arc, in which Calvin writes a school paper on the T. rex predator/scavenger debate, he argues that T. rex was a predator because "They're so much cooler that way." T. rex is also featured as the protagonist in the long-running webcomic Dinosaur Comics by Ryan North. Various T. rex have featured in stories published in the British comic 2000AD. Ursula Dubosarsky's picture book, simply called Rex and illustrated by David Mackintosh, concerns a pet lizard who assumes the proportions of a T. rex in the imagination of a series of children. In Pokémon X and Y, there is an evolution family consisting of Tyrunt and Tyrantrum both of which are based on Tyrannosaurus. ^ a b Bakker, Robert (2000). "Prologue". In Fiffer S (ed.). Tyrannosaurus Sue. New York: W. H. Freeman & Company. pp. xi–xiv. ISBN 0-7167-4017-6. ^ "Mining for Mammoths in the Badlands: How Tyrannosaurus Rex Was Dug Out of His 8,000,000 Year old Tomb," The New York Times, December 3, 1905, page SM1. ^ "The Prize Fighter of Antiquity Discovered and Restored," The New York Times December 30, 1906, page 21. ^ a b Bakker, R.T. 1986. The Dinosaur Heresies. New York: Kensington Publishing, p. 240. On that page, Bakker has his own T. rex/Triceratops fight. ^ TYRANNOSAURUS REX (July 26, 2011). "T. REX - A Dinosaur in Hollywood (2005)" – via YouTube. ^ "T. rex's Missing 3rd Finger Found Archived October 19, 2007, at the Wayback Machine," Discovery News October 17, 2007. ^ PhilsAttic (April 14, 2011). "Phil Tippett's Prehistoric Beast" – via YouTube. ^ Poling, Jeff (1998). "Skippy the dinosaur". Journal of Dinosaur Paleontology. Archived from the original on February 4, 2007. Retrieved March 1, 2007. ^ "Dino Land Travels Database Houston Museum: Tyrannosaurus". October 27, 2009. ^ "Türkiye'nin Gündemi Burada - Trextuning - Gündemle ilgili en son gelişmeleri web sitemizde okumak için Trextuning.com!". Türkiye'nin Gündemi Burada - Trextuning.